The first instalment drove over 25 million downloads worldwide since launch in May 2016. The free-to-play mobile game lets players race an epic selection of highly tuned vehicles across the roughest terrains, including snow, water and asphalt. New vehicles include The Monster, The Tank and The Amphibian, which all posses unique specs that allows racers to select the best for ultimate performance, across a series of physics defying tracks. Hill Dash 2 introduces ARKit functionality, to the MMX franchise. Racers can view their tuned up vehicles in the real world via their device’s camera. This enables enthusiasts to share their garage with friends, and show off their designs and customisations. The free-to-play mobile game allows petrol heads to compete against real drivers, as they climb the global PVP ladder to earn rewards, across a series of tiered leagues for competitive racing. Winning is everything, as players that cannot keep up with the pace are demoted if too many losses are picked up throughout the season. In-game events will play a pivotal role in MMX Hill Dash 2, which also offers racers the chance to unlock new skins to customise their collection of cars. 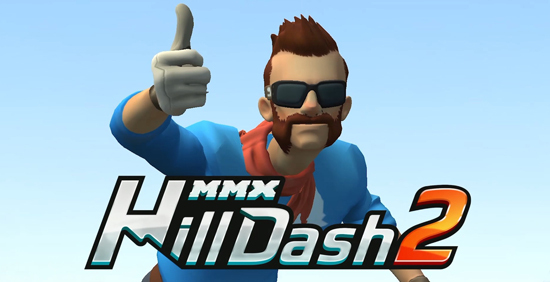 Buckle up and slam down your right thumb, MMX Hill Dash 2 is available to download today on iOS and Android.